This iExpression is applied to the rotation of a 2D layer. It rotates the layer such that it always "looks" towards a given line. Each layer looks at the point of the line that is closest to it. In other words, the direction in which the layers look is perpendicular to the direction of the line. The line has an infinite length and is given by two (arbitrary) points on the line. The rotation can still be adjusted using keyframes as usual. is the first point on the line at which the layer should "look". 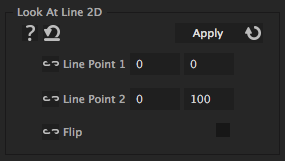 is the second point on the line at which the layer should "look". flips the rotation such that the layer does not look at the line but looks away from it (i.e. turns its back on it).